My drivers side electric window is "possessed" & has a mind of its own. The panel match ups are very average on my RS250 AGP (give or take 3mm : / With windows down, the sky light roof liner cover must be open, otherwise it blows in the wind and sounds like my grand mothers dentures chattering away. All things aside, my car is a real head turner, handles like a go kart, and is "Nothing like a Golf"
Finally decided which car... a 265 Cup! Got bitten by the RS Bug!! Hey Dale, welcome. Remember me ? I have the "other" RSAGP that came in for RS cap replacements, & ID plaque (#40) couple of weeks ago...... I think I got the second last one from Moonee Ponds, & Have now travelled 5k. I am still to contact Silvio from Glenroy Exhaust (after hearing yours in the car park : )- Although after having a 3" high flow on my previous 2lit turbo, the relative quiet is a nice change. The K&N filter via Demon Tweeks, was a good investment with slightly better throttle response, and subdued induction noise. Have seen you around the local area a bit (i'm in Essendon). cheers, Neale. The individually numbered ID plate (for the gearbox console area) & RS centre caps are finally in at last. Getting them on Friday (wonder if they will let me keep the diamond centre caps ? Hey Keith, Welcome aboard. where are you from ? The amount of comments you get re this car is amazing ! I get comments every day, even old ladies ! Forget about all the other hot hatches on the market. The RS AGP LE turns heads & starts conversations with total strangers. Its like walking a baby labradour. Thanks for all the replies, I didn't realize that the AGP centre caps were supposed to be "RS" caps & not "diamond" Will follow this up with the Melbourne Dealer as well as ID plate # I'm going to enjoy this site..... I was a member of Opelaus.com (also a very good site, my previous car was an 04 Opel Astra SRi turbo in Arden Blue - only 200 of those in AU). Cheers, Blackie. Thanks, yes the "go fast" pedal is awseome Have 2,000k's on clock now. I'm in Essendon, Melbourne. For me, it was a toss up between the black or white. I went to the Melbourne GP, for a sneek peek at the AGP LE , where it was un veiled (this was after i'd put a deposit on one). Loved the Red Bull races.. As mentioned, I still dont know what # is mine yet. However, the "all black", is my name sake.... (my surname) For I am "The Black Wiggle" lol... Future projects: Black Euro plates, I'm also looking at a few tasteful modifications, including red re spray of the very bottom lower front splitter. Black out renault front & rear badges, with a red high light "behind" the re sprayed front badge (where it is currently grey). Removing the "megane" word from rear of the car. Also, perhaps 2 red highlights on the rear diffuser (the two "vertical" lines either side of the exhaust). 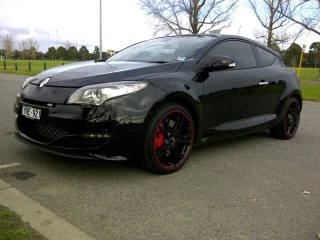 I think this may really set off well against the all black/red 19" alloys. K&N air filter, & removing middle silencer.... cheers, Neale.